Potato and Leek soup is one of the hearty ones that was a big hit the other day. My son and my husband both loved it! The leeks gave a nice a mild flavor that went perfectly with the potatoes and the addition of some cream added a little depth to the flavor. 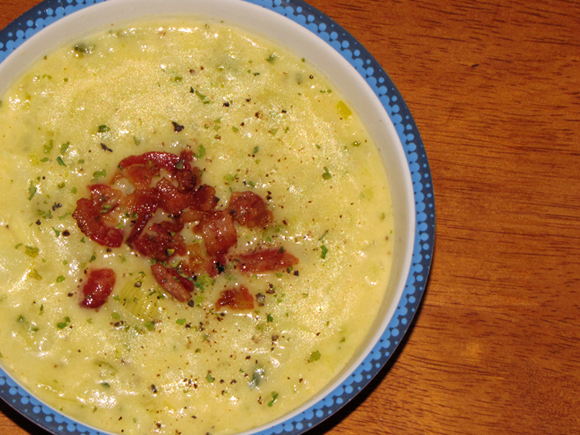 This soup was really good and it's a healthier twist to the average cream of potato soup. The particular thickness comes from pureeing the potatoes, and there isn't much in there, but you can always leave out the cream if you'd like. 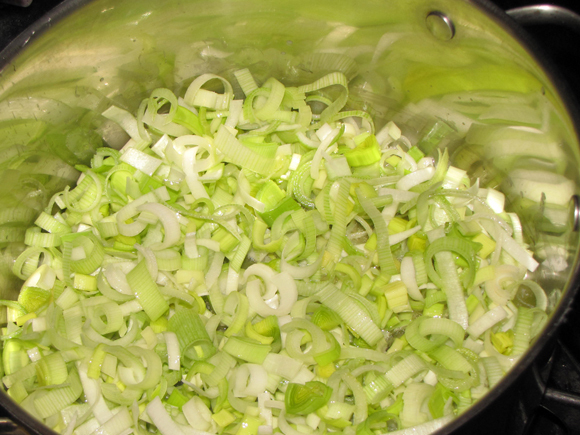 Only use the white and light green parts of the leeks. To cut them: slice off the top green leaves leaving the bottom part whole. Next, slice the bottom part in half lengthwise then chop into 1/4" slices. 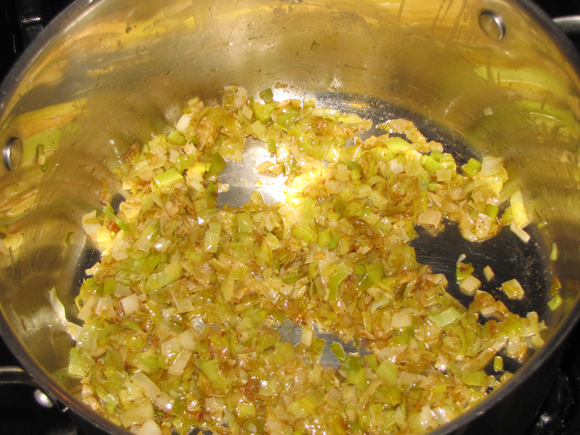 Cook the leeks and onions until they are wilted down. This took about 20 minutes over medium-low heat. Be careful not to burn them thought because they will taste very bitter. When adding the broth to the leeks and potatoes, only use enough to 'just' cover them. If you add too much, the soup will be too thin. 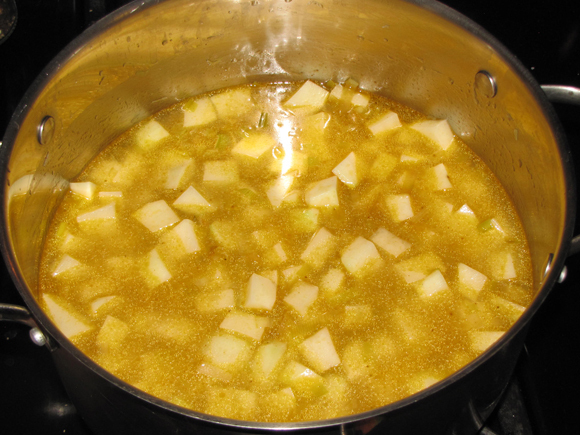 Adding just enough to cover the potatoes lets you control the consistency of the soup better. Start with about 2 1/2 cups then add more as needed. You can always add more broth at the end if it's too thick. 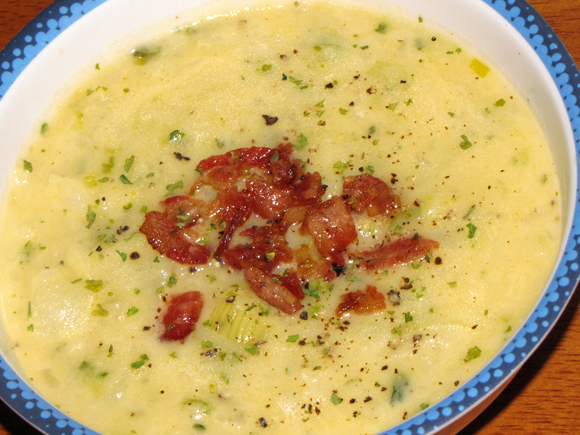 We added a few bacon crumbles on top because, well, bacon and any potato soup are just made for each other. The saltiness was a really nice compliment with each bite. 1. Place bacon in large stock pot and turn heat to medium-low. Cook until crispy, stirring frequently. Remove bacon and set aside on paper towel lined plate, leaving 2 TB bacon grease in the pot. If you're short, add enough olive oil to make 2 TB. 2. Add leeks, onion and salt. Cook over low heat until very soft and wilted. Stir frequently to prevent burning. Add paprika and celery seed. Stir and cook for one minute. Add potatoes and stir until coated.3. Pour over chicken broth until just covering the potatoes. I used 3 cups but you might need more or less depending on the size of your potatoes. 4. Bring to a boil then lower heat. Simmer over low heat for about 20-30 minutes or until potatoes are soft. 5. Ladle batches into a blender and give it a whirl to puree it. Be careful not to fill it too much or you'll get hot soup everywhere! (Alternately, use an immersion blender if you have one.) Return it to the pot and stir well. Love potato soup and I'm sure the leeks would just make it that much better. Looks awesome!